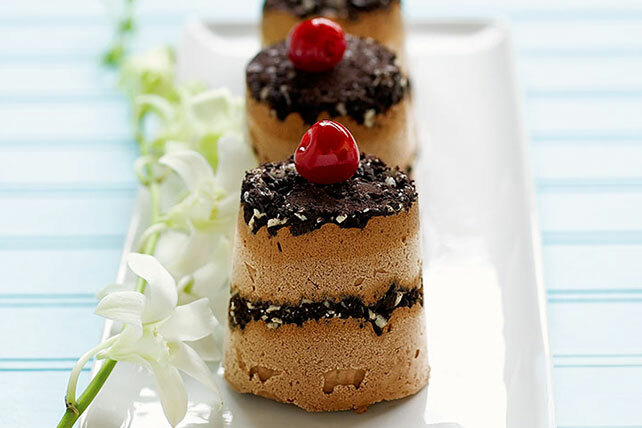 Knock their socks off with this elegant frozen chocolate dessert. It's everything you could ask for in a soufflé—only much, much simpler to put together! Spoon half each of the cookies and pudding mixture evenly into 8 (8- or 9-oz.) paper cups; press gently with back of spoon to release air pockets. Repeat layers. Save 80 calories per serving by preparing with fat-free milk, 2 pkg. (1.4 oz. each) JELL-O Chocolate Flavor Sugar Free Fat Free Instant Pudding, COOL WHIP LITE Whipped Topping and Reduced Fat OREO Cookies. Prepare using 2 pkg. (3.4 oz. each) JELL-O Vanilla Flavor Instant Pudding and chocolate chip cookies (2 inch).